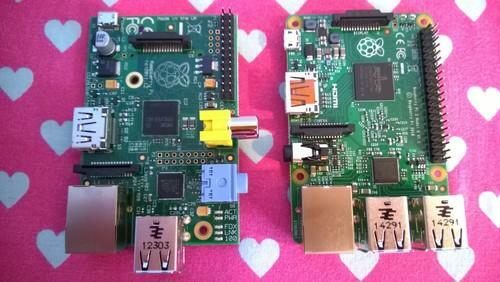 The original Raspberry Pi Model B (left) and the Raspberry Pi 2 Model B (right). The extra USB ports rock. Let's cut right to the chase: This thing rocks. The new Raspberry Pi 2 Model B fixes the most glaring issues of the three-year-old original Pi, and even better, it manages to do so at the same $35 price point of its predecessor. This credit card sized-mini PC delivers a shocking amount of value for the money. Don't head into this thinking the RP2 is some sort of radical leap forward, however. As Apple has done with the iPhone, the Raspberry Pi 2 is an evolutionary tweaking of the first model's then-revolutionary concept. Most of the new model's features are exactly the same as the original, which helps to ensure full backward compatibility. But the changes the Raspberry Pi Foundation did make were very welcome ones indeed. Because the performance changes are the big difference in the Raspberry Pi 2 Model B, let's dig into that first. Beyond the upgrades, the micro-PC uses the same VideoCore IV 3D graphics processor as its forefathers, but that was already a (relatively) beefy processor that punches above its weight class with full 1080p video output capabilities. The Raspberry Pi 2 also features an Ethernet port, a full HDMI port, a jack for combined 3.5mm audio and composite video, and a micro-SD card slot. Tinkerers will appreciate the 40 GPIO pins (the original Model B had 24), and CSI and DSI connectors for direct connections to expansion boards, displays, and more. Collectively, the upgrades add up to dramatically improve the Pi's performance. U.S. Pi supplier Element14 sent me a Raspberry Pi 2. I had an old, original Raspberry Pi Model B already knocking around my office. I loaded each up with the recommended Linux-based Raspbian 3.18 operating system stashed in the Raspberry Pi Foundation's NOOBS installer tool and got to benchmarking. The results were astonishing. First, I ran a pair of browser-based benchmarks in the included Epiphany browser to see how performance stacks up in real-world situations. As you can see in the graph below, the Raspberry Pi 2 chewed through Sunspider roughly 3.5 times faster than the first Model B.
I also wanted to test the new processor's capabilities directly, so I installed the Sysbench benchmarking tool and ran its CPU test. The RP2 delivered much improved single-thread performance over the Raspberry Pi Model B, but the real boost came in multi-threaded performance, thanks to the shiny new quad-core processor. Using the full power of the new processor, the Raspberry Pi 2 was more than five times faster than its single-core predecessor, and that's without touching the RP2's baked-in overclocking capabilities. Zoom! The performance increase provides tangible real-world benefits as well. While it took the Model B a full 1:01 to boot up, the Raspberry Pi 2 hit the desktop in a mere 33 seconds. What's more, actually using the Raspberry Pi 2 is a far more pleasurable experience. Programs and websites no longer take forever to launch in Raspbian (though you still won't confuse the Pi 2 for a full-powered PC). Navigating the menus in the home theater PC-focused OpenELEC operating system is far more fluid on the new hardware. Simply put, you can actually use the Raspberry Pi without wanting to scream and pull out your hair at the excruciating slowness. That, paired with the extra USB ports, makes for a staggering improvement in sheer usability. Along those lines, the stark Raspbian operating system comes preloaded with helpful software, including the aforementioned Epiphany browser and even a free, stripped-down version of the blockbuster Minecraft game created just for the Raspberry Pi. A central "Pi Store" points you to more than 100 additional games and apps, including productivity tools like the LibreOffice suite. The Raspberry Pi Foundation's goal with these devices is to introduce people to programming, however, and it shows in software that's preinstalled on Raspbian. You'll find versions of Wolfram Mathematica, Python program creation tools, and Scratch, an animation coding IDE for kids. That focus on teaching the basics of computer science permeates the entire Raspberry Pi experience. While the installer is well laid-out and will get you up and running in mere minutes, you will need to roll up your sleeves and delve into the command line. Just getting this thing running is an educational experience in and of itself for people weaned on Windows. Speaking of which, another cool tidbit: When Microsoft releases its version of Windows 10 for the Internet of Things, it will be made available free of charge to Raspberry Pi 2 users. A microSD card with a compatible operating system installed. 4GB works, but a greater storage amount would be better if you plan to save files, install additional software, et cetera. You can purchase microSD cards with Raspbian preinstalled from Element14 and other Raspberry Pi suppliers. You should probably buy a case to shelter the exposed board as well, to avoid potentially damaging it. Element14, the U.S. Raspberry Pi supplier that supplied us with our review sample, sells pretty much every Raspberry Pi accessory you could ever need. This new generation of hardware doesn't change the value proposition of the core Raspberry Pi experience itself whatsoever--an experience that clearly resonates, as more than five million Raspberry Pi models have shipped worldwide. It still rocks as a maker tool. It still rocks as a teaching tool for budding computer programmers. It still performs admirably as a potential itty-bitty storage server or low-cost home theater PC. You still wouldn't want to use this for your primary computer--not that the Raspberry Pi 2 is intended for that. What the Raspberry Pi 2 Model B does is take all of the use cases the original Raspberry Pi excelled at and supercharge them. This thing is a beast compared to its predecessor, and the extra duo of USB ports makes it far easier to use. (Begone, USB hubs!) If you've want a cheap way to dip your toes into computer programming, the maker movement, or Linux, the Raspberry 2 comes very highly recommended.